The group from Voronezh LITTLE DEAD BERTHA was born in march 1994 with following members: Sergey Galushko – guitars, Alexandr Romashov – vocal, Jury Sveshnikov – bass. After change of several drummers the group stand on Dmitry Paltsev. So the group began to work under their first material in thrash-metal style. It has been recorded two rehearsal demos (all about 45 min. ), then the group has headed to doom-metal. The group has adjoined second guitarist Stanislav Chursin and Veronica Belyaeva - violin and vocal. In July, 1995 was recorded the first two-songs demo "The Reflection About Angels", then take away in army Jury (August) and after that Alexander leaves the group (october). Replacement to the first find on behalf of Alexey Skorovarov. And the vocalist appears only in February 1996, he becomes Dmitry Zamaruev. In that line-up since November 1996 till April 1997 was recorded the program "In Memorium Premortis" (7 songs, intro, instr., 47 min.). Later exactly year this demo is issued on MC on Moscow label HOBGOBLIN rec. In November 1997 line-up increases up to seven person with arrival Maria Sotnikova - keyboards. In the beginning of July 1999 record of the new program "Two sides …" (8 songs, intro, instr., 61 min.) comes to an end. The material is sustained also in style doom, but became more vigorous and melodious, that has allowed musicians to get rid of the bothered comparisons with MY DYING BRIDE, and also more technical and professional by way of a sound. During the work above an album in group there was a crisis, which has resulted in Stanislav, Alexey, Dmitry´s Z. and Maria leaving. Having remained together, Sergey and Dmitry P. begin search of new musicians. In group again there comes Jury, who has come back from army, and, a little later, Dmitry Z. comes back. The line-up is completed with Tatyana Vojtenko - keyboards (January 2000). In September 2000 occurs two events: the group decides to reduce the name up to BERTHA and "Two sides …" out on МС on HOBGOBLIN Rec. (Moscow). The group starts to work above a new material in line-up: Sergey (guitars), Dmitry Z. (vocal), Jury (bass), Dmitry P. (drums), Tatyana (keyboards), and also Svetlana Hodyakova (back vocal). Work above an album proceeded two years and has been finished in December 2002. Such long term has been connected to search of new sounding group in the updated structure, and as different unforeseen circumstances (from studio the computer with almost mixed material has been stolen). Music of a new album (14 songs, over 67 min.) is sustained in style gothic-metal. In July 2003 the new album under the name "Light And Shadows" has been released on VALIANT MUSIC Prod. on CD. 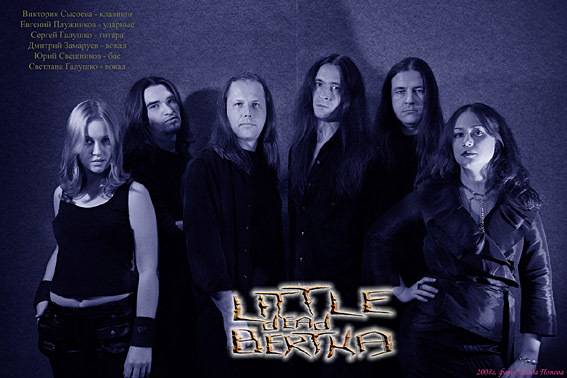 In September 2003 the group returns the old name LITTLE DEAD BERTHA. as mastery of arranging and performance which was culminated for 11 years of group existence. Album includes 7 new track and a bonus – replayed track from the original 1994 demo.